This entry was posted on March 3, 2015 by Jessica Anderson. Why should new spring trends be just for fashion and home decor? Trophies and awards have exciting new trends as well, and a month ago I attended our annual trade show in Las Vegas and scoped out the hottest new awards for 2015! So what are the top award trends for spring? Our new pearl line of acrylic awards are an example of new color trends in awards. Just as in fashion, color is huge in awards. 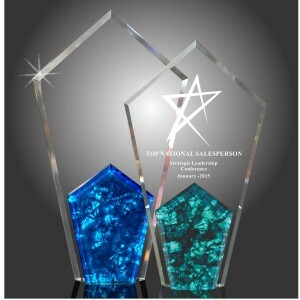 New colorful resin designs, colored crystal awards, and sublimated colored gift items continue to be hot this year. Our new "pearl" line of acrylic awards showcases this trend; we will also be adding many new sublimated products this spring. This allows customers to personalize items with colored photos, colored logos, and bright customized designs! Coming in many precious tones and with various finishes, the metallics appear to be stronger than ever, both in fashion and in awards. Metallic designs are popular in corporate crystal awards and new chalice cup trophies. Watch for new designs coming this spring! When you are invited to a friend's house for dinner, what do you bring? A bottle of wine, of course! Personalized wine products, such as engraved wine bottles, wine storage boxes, and personalized wine tools, continue to be a trend this year. With the popularity of wine, it's no surprise! Just like last year, unique, personalized pieces were everywhere in Vegas. Awards with full color photos, 3-dimensional acrylic awards made out of logos, and crystal awards filled with custom designs were hot at the show. We now offer a Special Order section on our website, where you can design your own awards...check it out here to find out more! 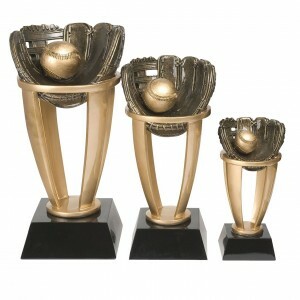 Get ready for the upcoming fantasy baseball season with a Tower Baseball Trophy! Trophies2Go is ahead of the trend, as we are the leader of Fantasy Sports trophies! Not only do we offer fantasy football awards, but also fantasy baseball, fantasy basketball, fantasy hockey and fantasy NASCAR! We are adding many new perpetual trophy cups, especially popular for our fantasy customers. Check out our huge selection of Fantasy Sports Awards here!